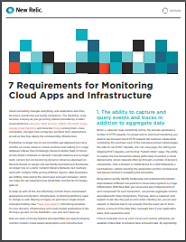 Cloud computing changes everything, and application and infrastructure monitoring are hardly exceptions. The flexibility, scale, services, and pay-as-you-go pricing options provided by modern cloud platforms—Amazon Web Services (AWS), Microsoft Azure, Google Cloud Platform, and tools like Pivotal among them—have completely changed how companies architect their applications as well as how they deploy the corresponding infrastructure. Enterprises no longer rely on one monolithic app deployed over many months on a bare metal or virtual machine host talking to a single database; instead, they increasingly choose to deploy fleets of microservices and/or containers on demand. Compute instances are no longer static servers but are becoming dynamic instances deployed on demand (based on usage) and seamlessly load balanced. Businesses no longer rely on a static Content Delivery Network, but routinely work with multiple CDNs serving different regions. Web developers are shifting more load to the client (your end user’s browser), which can make the user experience less predictable. And the list of changes goes on.